If you’ve played the Rovio game Angry Birds for any length of time, you’ll know Ari Pulkkinen‘s catchy theme. Indeed, the music is almost as addictive as the game — as some of these cover versions indicate. The Genevieve Trio‘s performance brings out a certain olde-worlde-folk-music quality that I really like. Accordion, upright bass (not pictured), and… is that an oboe? I could imagine this version being on the soundtrack to Delicatessen or Amelie. The song starts at about 30 seconds in. Here’s a headless group identified only as Angry Birds Orchestra. For some reason, they’ve been filmed only from the neck down. Less background noise than the above (almost no background noise, in fact), and the emphasis here is strings! Robwarriors62, an 11-year-old English lad, offers his rendition of the theme. This version brings out the march in the song. Though this is solo piano, the arrangement makes it easy to imagine a marching band performing the tune. 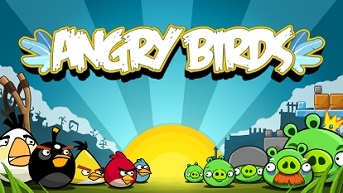 With a “whee!” and a >paf!< that concludes today’s whimsical tour of Angry Birds music.